When we look up at the Moon, especially when it is Full, it seems to drape the whole landscape with a mild silky looking light which removes the starkness of day, so that everything seems to have blurred edges against the backdrop of a star studded sky. The world seems hushed and familar things take on a less “real” appearance. It is hard to believe that the Moon produces no light of its own but reflects the light of the Sun. This is like our unconscious, which is the Moon part of our psyche. Everything that we experience through our conscious being, symbolised by the Sun, is reflected back to us through our unconscious, the Moon in reflections. Let us take a walk through this card to reach the unknown beyond. Water greets us first.The Moon governs the tides and water and growing because it affects the amount of moisture that is coming up through the soil. Water represents our emotions. We are sometimes flooded by emotions, sometimes we are shallow, sometimes we pour our heart out. A lobster is coming to the surface. Lobsters cast off their shells for new ones, which lends itself to the rebirth/cycling association.When the Lobster in the Moon card surfaces slowly into our consciousness we are reminded of the cyclical nature in our lives and what protection we may need for the path on which we will embark. We are prone to protecting our personas or the face that we show to the world by keeping our deepest side hidden. This side is our animal nature, our deepest and darkest desires which want to be manifested and have an airing but are usually kept at bay. it is the deep unknown part of our nature, that others do not know and indeed, we do not even know of completely ourselves. We will not allow it air time. Sometimes it just wants to be heard, sometimes it will push upwards into our consciousness with great force and we will wonder what made us think, say or do a certain thing. There is a domesticated dog and a wolf. This represents the polarities of our nature. The former represents our socialised, tame side that we usually display whereas the wolf is a symbol of our primal urges. As a member of the canine family, the wolf is also a symbol of loyalty and intelligence. The wolf is howling. It is calling us to look deeply within ouselves, to look at the barometer of the emotions. Are we really happy and fulfilled with ourselves or is our need to fit in and please and be obedient and faithful to our public persona/image separating us too far from our core self? Is there a tension? Are we expending a lot of energy in keeping up appearances perhaps to be what others are reflecting on us like an obedient tamed dog? Do we need to get in contact with our fun, wilder side which can unleash our spontaneity and creativity. The Moon card in the Rider Waite deck represents the life of the imagination. There is a winding path which twists and turns that leads between the towers beckoning us to visit the unexplored. The winding path leads between two pillars. These tell us that one of the messages in this card is balance. Rather than seeing things as left or right, black or white, perhaps we can consider a balancing path, combining facts of both. But to do that we need to visit our unconscious side and see what it has to offer us in bringing more creativity into our lives. The path represents direction and the road that we choose to take at any time. Paths signify beginnings and ends of journeys, both physical and mental. The Moon is gazing down to the left. She is emitting calmness and look like she could be in a meditative state. 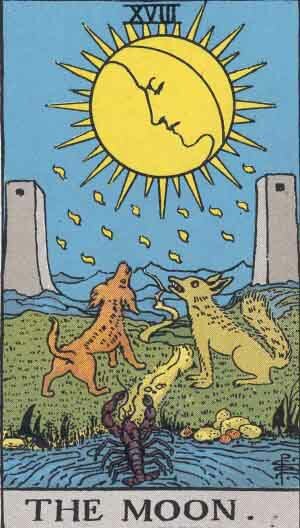 The dog and wolf are each vying for attention but the face in the Moon, the mind, remains calmly focussed. It is giving us guidance to remain centred and calm. The Moon is encouraging us to look at the deeper side of our nature, to look at things from a different perspective and not to be afraid of seeing and doing things slightly differently. The Moon symbolises cycles, times, reflection and emerging from one phase to another. Lunar power influences oceans and water and as we are composed of about 70% water, it influences us too. It symbolises the intuitive side of us. We need to look at our level of awareness. It is a call to listen to our intuition t0 let it influence our direction, by showing the way. Sometime we get confused and we find it difficult to know where we are coming from or where we are heading. The Moon invites us to connect with your intuition and look for signs through dreams, synchronicities and hunches that will show us which path to take. From that standpoint you will feel calm and assured with your choices. The Moon card is linked to the astrological sign of Pisces, the ruler of the 12th house. It is ruled by Neptune. The Moon & Pisces is a powerful combination that drives us to listen to the inner voice & focus on spiritual aspects of our existence. So be calm and face your inner thoughts & fears, take a step to triumph over what holds you back, strive for your dreams & release your creative potential. This entry was posted in Dreams, Language and The Unconscious, Magickal Workings, SOW School Of Wyrdynamics, Tarot and tagged Full Moon, Magickal Working, meditation, The Moon Tarot Card, the unconscious. Bookmark the permalink.